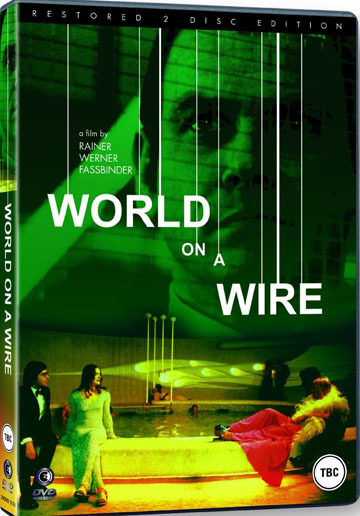 Rainer Werner Fassbinder's two-part sci-fi classic, originally made for German television in 1973, posited the idea of a computer-generated world over a quarter of a century before the making of the Hollywood blockbuster The Matrix. Simulacron 1 is the highly advanced project of a near-future cybernetics company. At the heart of the project is a supercomputer programmed to create a virtual world populated with computer-generated people known as 'identity units'. When the project's leader has a mental breakdown and commits suicide, his successor, Fred Stiller (Klaus Lowitsch), takes over. However, as he delves deeper into Simulacron, the line between the real world and its simulated counterpart becomes increasingly blurred, and before long he too is spiralling into madness. Fassbinder’s World on a Wire: Looking Ahead To Today with Michael Ballhaus, Fritz Müller-Scherz, Karl-Heinz Vosgerau, Moritz Eggert, Roland Blach, and Günter Rohrbach. A film by Juliane Lorenz. Extensively restored using the 16mm A/B reversal rolls: scanned in 2K resolution, colour corrected and extensively cleaned of dirt, debris and scratches under the supervision of the Director of Photography Michael Ballhaus.